GS1-DataMatrix barcode symbols may be easily created with IDAutomation Data Matrix products, all of which support GS1 AIs (Application Identifiers) and the FNC1 (Function 1) symbol character according to the ISO/IEC 16022 standard. The encoding mode must be set to ASCII, which is Mode 3 in IDAutomation products. The ApplyTilde or ProcessTilde function must be enabled. The data within the symbol must start with the non-printable FNC1 character, which is encoded with the ~1 character combination. The number directly after the ~1 is the Application Identifier (AI). The AI combined with its associated data makes up an element string. Multiple element strings may be encoded in a single symbol according to the GS1 AI Specification Reference. After the first FNC1, additional FNC1s should only be inserted after variable length element strings. It is preferred that all variable length element strings are encoded after all fixed length element strings. Fig. 1 below is a symbol encoding of the GTIN string (01)3456789012345 with the date field of (15)171231. According to the GS1 Application Identifier specification, an additional FNC1 is not necessary in this symbol because the preceding element string of (01) is a fixed length. Fig. 1: GS1-DataMatrix symbol encoding multiple element strings with a single FNC1 function. Fig. 2 below is a symbol encoding of the GTIN string (01)10614141543219 with a variable batch element string of (10)3456789 and a variable serial number element string of (21)3456789012. Because the AIs (10) and (21) are both variable, an additional FNC is required between these according to the GS1 Application Identifier specification. Fig. 2: GS1-DataMatrix symbol encoding multiple variable element strings. According to GS1 specifications, when GS1 emulation is enabled, the first FNC1 character should be decoded as “]d2” and any additional FNC1 characters will be decoded as <GS> (ASCII 29). 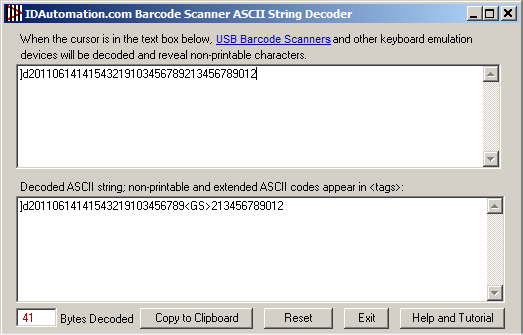 The <GS> function is usually only visible when scanned with the Barcode Scanner ASCII String Decoder. Not all scanners properly decode the first FNC1 character as “]d2”. The screenshot below is the decoded symbol of Fig. 2 above scanned with the IDAutomation 2D USB Scanner. To enable this decoding within the scanner, refer to the GS1-DataMatrix emulation programming guide. Refer to GS1’s GS1-Data Matrix Guideline for complete specifications.